Michael-In-Norfolk - Coming Out in Mid-Life: Will Young American Voters Learn From Young Britons? Will Young American Voters Learn From Young Britons? LONDON — As Britain took stock on Friday of the stunning results of a snap election that wiped out the parliamentary majority of Prime Minister Theresa May and her governing Conservative Party, one narrative bubbled up to the surface: The youth had spoken. The election results were fueled partly by a higher turnout rate among young British voters who had long been angry at the results of the referendum last year to leave the European Union, known as Brexit. That vote, overwhelmingly supported by older Britons, was seen by many younger people as a threat to their jobs, their ability to study abroad and their desire to travel freely across the bloc’s borders. In other words, the vote by young Britons on Thursday had a whiff of payback. “I was so angry about Brexit that I buried my head in a pillow and screamed,” said Louise Traynor, 24, a waitress in the southwestern district of Battersea in London, who had never voted before Thursday. Shaking her head in frustration, Ms. Traynor said she had been angry at herself because she hadn’t bothered to vote the first time around. “I was stupid enough to think that the country had some sense,” she said. The Brexit referendum, Ms. Traynor said, could lead to closed borders, which threatened to tear her long-term Spanish boyfriend away from her, and her away from the group of European friends she had made while working at a tapas restaurant. On Friday morning, she said, much of the anxiety she had felt about her future was replaced with excitement when she realized that her vote for the opposition Labour Party had denied the prime minister a mandate. Jeremy Corbyn’s Labour gained 31 seats, while Mrs. May’s party lost 12 seats and its overall majority — leaving a hung Parliament, one in which neither side has enough lawmakers for control. In a statement on Friday, Mrs. May grimly announced that she would form a minority government with the Democratic Unionist Party of Northern Ireland. “Does Theresa May care that I’ve been on minimum wage for three years and I’m still paying my student debt?” she asked. “No, she doesn’t. All she cares about is Brexit and getting her deal.” Many young Britons felt compelled to vote after the Brexit decision, because of austerity budgets and what they saw as the establishment’s tendency to serve the interests of the rich. This year saw a spike in young people registering to vote — more than one million people under 25 applied. The turnout in constituencies with younger voters rose significantly, appearing to benefit Labour. The turnout for 18- to 24-year-olds was 66.4 percent, according to Sky News data. Other reports put it as high as 72 percent. In the 2015 general election, the rate for voters of the same age range was 43 percent, according to Ipsod, a marketing and opinion research company. The payoff was evident in Battersea, where Labour seized the Conservative seat. 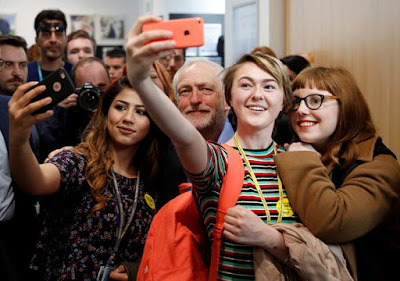 Jennifer Hudson, a senior lecturer in politics at University College London, said the effectiveness of Mr. Corbyn’s campaign could be seen in a picture of him with young supporters, cheek to cheek. “We may still be far from the final result that we wanted, but this feels like progress, and hopefully, it gives out a message to the pompous Tories that they can’t make bad decisions on our behalf,” said Luke Rossi, 25, a musician who had voted for the first time. In Battersea Park, students ages 19 to 21 were debating possible political outcomes of the election aftermath. All said they hoped Mrs. May would be removed as leader of her party. Trump, Mike Pence, Mitch McConnell and and Paul Ryan are all an embarrassment to America. Even more so than the Tories, Republicans have nothing to offer to young Americans given the GOP's sole desire being to give enormous tax cuts to the wealth while slashing benefits and the social safety net that aids everyone else. I hope young voters wake up to this reality and get out and vote in their own interest. It's a virtual guaranty that aging whites - and evangelical Christians - do not give a damn about the long term future of the country or economic opportunity for all.